Bread 46 was the Cinnamon Buns recipe from Peter Reinhart’s The Bread Baker’s Apprentice (affiliate link). I had planned to make a different cinnamon roll recipe but didn’t have the ingredients I wanted for it. It surprised me that I hadn’t noticed this recipe from the book sooner, despite making probably about half of the book’s bread recipes. Thus, brunch on Christmas morning was cinnamon buns. You can bake the rolls on the same day you make them, but I didn’t want that much work on Christmas (or any morning, really). To make brunch happen, I made the buns the day before and put them in the fridge overnight for their second rise. They became puffy in the meantime, and I removed them from the fridge 3 hours before I wanted to bake them to remove the chill. Some aspects of these rolls were amazing, and some needed work. I’ve made great cinnamon rolls twice before (from Alton Brown’s overnight recipe and from a recipe from Smitten Kitchen), and based on those, I’ve recommended some adjustments below. I think this is the best dough for cinnamon rolls that I have ever made. It was puffy and tender once baked. The rolls had a beautifully open crumb. I enjoyed the hint of lemon in the dough. I need to note, though, that my dough might have been a little slack/wetter than the recipe intended, as my log of cinnamon rolls did not maintain its round shape before I cut it. Although I loved the dough, the rolls were not gooey or cinnamony enough for my taste. I think that it needed about twice as much sugar as originally called for in the filling, and definitely more cinnamon, so I changed the recipe above. Notable about this recipe is that you don’t use butter in the filling, and it may have needed it. I can’t tell without testing it, so I’ve mentioned above that it’s optional. 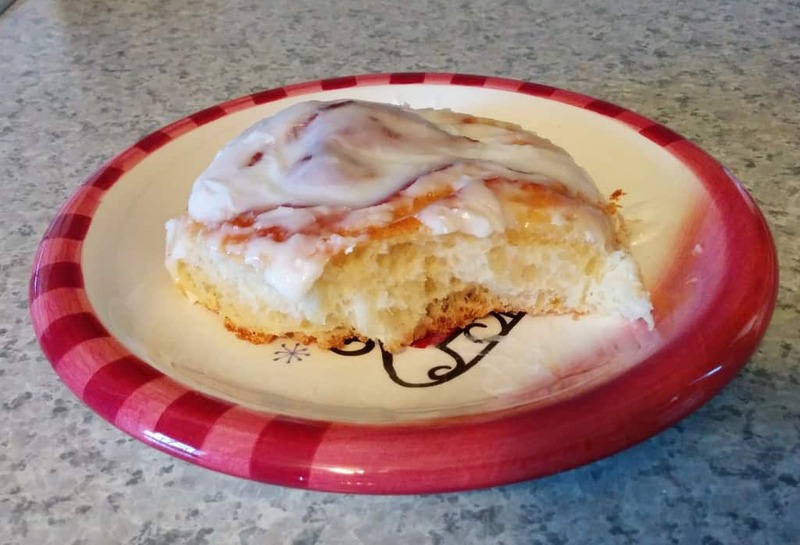 A note on the glaze – the original recipe made twice as much glaze as I listed above. I made the full amount of glaze that the original recipe called for, but even using only half of what I made, it was too much for me. If you make the cinnamon swirl with more sugar, you won’t need as much glaze. Also, I may have gotten too much lemon extract in my glaze; the citrusy glaze was certainly more lemon than I want with cinnamon rolls. We enjoyed these rolls mostly because lemon rolls are a nice change of pace, but if we’d really wanted cinnamon rolls, I think we would have been disappointed. I really enjoyed the thick consistency of the glaze, but I think that vanilla rather than lemon might be a better choice. I do prefer this over a cream cheese frosting, both because it’s simpler and involves pantry ingredients, rather than cream cheese, which is a special purchase for me. Like all breakfast rolls, these are best fresh and warm. On the second day, they were still fine when reheated, but they weren’t nearly so good as they originally were. I love the bread part of the rolls, and think that with the changes above to the filling and glaze, the rolls will be excellent. I’m looking forward to trying them again. Want more cinnamon rolls somehow? 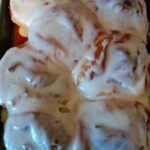 You can try these overnight cinnamon rolls adapted from Alton Brown; these cinnamon rolls adapted from Smitten Kitchen; these super-tender, quick and easy cinnamon rolls; or these gluten-free cinnamon rolls if you need to make something gluten-free. A recipe for fluffy, delicious Cinnamon Rolls, adapted from The Bread Baker's Apprentice. Make the evening before, then bake for breakfast in morning! Alterations from the original are noted below. Cream the sugar, salt, and margarine at medium-high speed with your paddle attachment of your stand mixer. Add egg and lemon extract and cream until smooth. Add flour, yeast, and milk, and stir on low until a ball forms. Switch to the dough hook and mix at medium speed for 10 minutes, until the dough is silky and tacky, but not sticky. I had to add a little extra flour to get to this stage. The dough should pass the windowpane test. Place in an oiled bowl, cover with plastic wrap, and let rise for 2 hours, until dough doubles in size. Place buns 1/2 inch apart, cut side down, on a baking sheet lined with parchment, or in another baking dish if desired. (I used a Silpat-lined baking sheet, as well as a ceramic dish with higher sides.) The buns should not be touching each other at this point, but will after they rise. Spray buns with oil and cover with plastic wrap. Proof buns at room temperature for 75-90 minutes, until they have doubled in size. Alternatively, you can place them in the fridge for 1-2 days. If you refrigerate the dough, pull them from the fridge 3-4 hours prior to baking to remove the chill. Bake cinnamon buns for 20-30 minutes (mine took 20) at 350F on the middle rack of your oven.